The Sport Mount Chest Harness from Pentax contains a platform with a 1/4-20 mounting screw that attaches to the tripod socket of your camera. Two wide adjustable elastic webbing straps plus an additional strap that runs down your back provide balance and support for the harness. A strap with quick release buckle fits around your chest securing the harness. There is a release on the bottom of the platform that allows your camera to slide from side to side for preferred positioning. The bracket also contains a spring-loaded button that releases the lower portion of the platform allowing your camera to be tilted downward so you can view the LCD screen. The camera platform is made of plastic and features a rubberized bottom that provides a firm grip for your camera. The strap is made from elastic twill webbing. 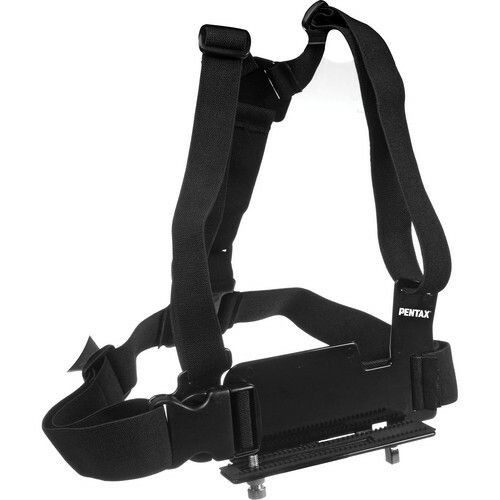 Box Dimensions (LxWxH) 8.5 x 5.0 x 2.5"
Sport Mount Chest Harness is rated 2.3 out of 5 by 3. Rated 5 out of 5 by Silverhair from Where did you get that great harness?! I use this to hold my waterproof Olympus Tough TG-2 while kayaking. Everybody who sees it marvels at the uncomplicated and easy to use design, which allows solid hands-free filming but also drops the camera face down at pull of a tab to turn video on/off, check images, or frame a still, zoom, etc. I tell them it is just as great as it looks. Feels totally comfortable and secure, fits smoothly overtop of my life jacket with good range of adjustment, gives me needed access with no fuss detaching from screw mount to hand camera to others. My one suggestion for improvement: make screw mount bolt from stainless, rustproof materials. Very hard to clean out all water after a day of action, and grease or oil don't mix with my camera or other apparel. Overall I would say this rig beats GoPro hands down, and others who see me using it agree. (I did try GoPro system first, sent it back). This one is a keeper! Rated 1 out of 5 by Syncro from Good idea in theory Bought this to hold my new Pentax WG-3 sports camera while skiing and other outdoor sports. Unfortunately both the quality and design were seriously lacking. The camera mounts to an ill fitting plastic base using the tripod mount, but it is anything but sturdy. The mounting harness is made of elastic straps that do not hold well and are not long enough. I am of average build and even with just a T-shirt I could not get a snug fit. Overall I was very dissapointed that Pentax would put their name on this item. Thankfully B&H gave me a prompt no questions refund, thanks guys! Rated 1 out of 5 by GV from I can't believe that Pentax put their name in this product. Very bad quality. Weak plastic pieces. Will this harness work for Pentax K3? Or would I need a bigger mount system? This harness can work with the Pentax K3. can I use this with a standard 35 mm camera, like the Pentax Kx?I'd like to use it for skiing under a jacket. Yes. This chest harness will be able to accommodate most standard size 35mm DSLR's, including the Pentax Kx. This harness will be the most secure way to attach your camera to your body while moving around. Does this work with smaller digital cameras like the Pentax WG-3 GPS camera? If so, can the camera angle be adjusted up or down while wearing the chest harness or is it a fixed position? Yes, this harness is actually designed for the WG series cameras and is compatible with the WG-3 PS model. The harness allows the camera to be shifted to the left or right to gain perfect positioning, and also has a quick release button which will allow the camera to be tilted forward to regard the LCD screen. Otherwise it is more or less fixed in place once you have it mounted.